This is my new favourite dessert! I love my job and am so fortunate to work with great people and amazing campaigns! After a live TV event, I got to eat one of the demonstrated recipes. Click this link for the real recipe. I know, it’s a hard life :). 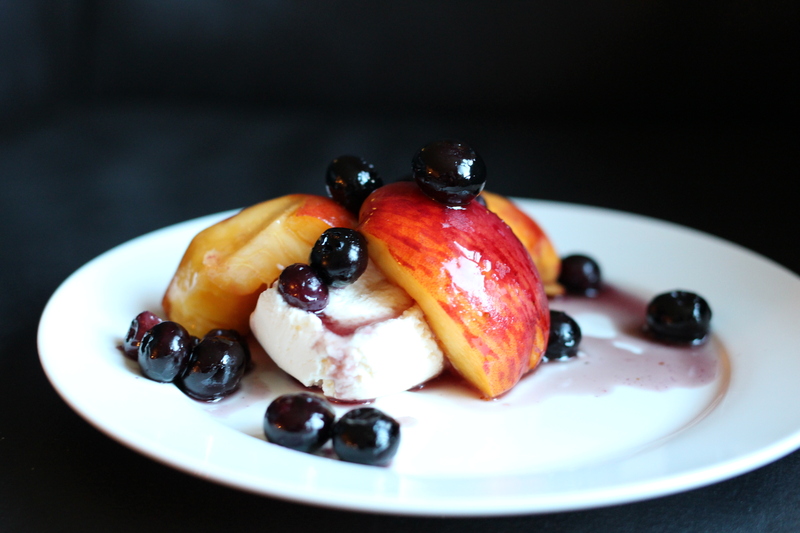 It was this simple, but gorgeous dessert from ProduceMadeSimple.ca. Click on this link to watch the TV segment. I am not in it – that part is not my job! So tonight, I invested in the ten dollar+ tub of mascarpone and recreated it even though I am trying so hard not to eat desserts. Darn you Chef D! ASIDE: I don’t know WHY the dairy industry can’t get it together and sell a smaller, cheaper size of mascarpone! As usual, I never seem to follow a recipe exactly. This one called for grilled peaches which are delicious, but I didn’t want to heat up the BBQ for one peach. I also don’t have a pan that makes grill marks so I used my non-stick frying pan instead. Finally, because I didn’t want to dirty a separate saucepan for the blueberry sauce, I just made do with everything in one pan. 1. 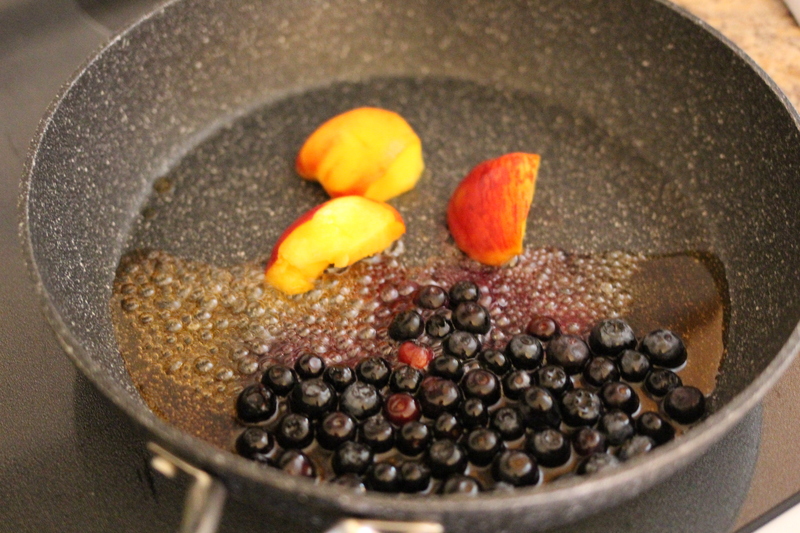 Wash the peach and blueberries. Cut the peach into three or four pieces. 2. Place peaches cut side down, on one half the dry (i.e. no butter) frying pan. Place the blueberries on the other side. Heat over medium heat. After 3-4 minutes, add the maple syrup over the blueberries. Some may leak over to the peach side…don’t worry, it’s all good. 3. Heat until fruit is steaming warm. My blueberries didn’t pop as they would if I’d used a separate pan but they were hot. 4. Spoon mascarpone on plate. Place hot peaches on top to cover the cheese and melt it. Then top with the blueberries and maple syrup. Enjoy immediately. It won’t last long. This recipe is so simple but has amazing flavour, and mouth feel. The cheese is cold, and so rich and creamy – it’s the perfect compliment to the hot, sweet fruit. The mixture of textures and flavours is incredibly satisfying in your mouth. It’s my new favourite! My kids had a huge dinner so I didn’t think they’d want to eat more but they ended up eating most of my dessert. I don’t know how I made this novice mistake! So I made another, even faster batch! ANOTHER ASIDE: After the children ate it all, they said that they didn’t like the mascarpone cheese and would have preferred a bowl of cut peaches, with a fork. Hilarious. Over medium heat, warm peaches cut into small bite sized pieces, with maple syrup in the pan (again – no need for butter or grease). Leave out the blueberries altogether. When the fruit is hot, plate over the mascarpone. Oh my goodness, still amazing! Just can’t get enough of those Ontario peaches! !